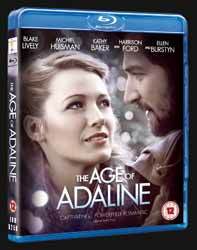 The Age of Adaline is a romantic tale with a hint of sci-fi and a smidgen of fairytale thrown in for good measure. The film stars Blake Lively as an average woman who was born in San Francisco at the turn of the 20th Century. One night she is involved in an accident that sees her car spin off the road and into a freezing river. She dies and then is brought back to life by a freak bolt of lightening. Several years pass and slowly she realises that she is not aging at all. The main narrative takes place in modern day San Francisco as Adaline, currently going under the name of Jenny, is in the process of preparing to alter her identity and move once again - an act she has had to do every 10 years so that people don't ask awkward questions about why she isn't aging. Apart from her daughter, who obviously knows everything, she has one other weakness an old friend who is blind, and so doesn't notice that Adaline has aged. She attends a New Years Eve party, with her friend, which is where she catches sight of Ellis. There eyes meet briefly. Later, as she is going home, before midnight, Ellis catches up to Adaline in the lift in an attempt to ask her out on a date. For years Adaline has led a solitary life, unable to let anyone in because doing so would mean sharing her secret as well as eventually watching them grow old and die. But Ellis pursues her and Adaline can't help but fall for his charms. Eventually the two do start dating and Ellis asks her to attend his parents wedding anniversary. But little does Adaline realise that this will open up memories from 50 years previously. It's hard to review The Age of Adaline without giving away too much of the plot. It really is a movie you need to go to blind, without knowing anything, if you're to get the most out of it. I was surprised to read a lot of the movie reviews at the time of the film's theatrical release. It received very mixed reviews. Personally I found it to be a beautiful, touching breath of fresh air in the current climate of movie reboots and superhero films (although, if you were being picky, you could argue that Adaline does has a super power). It explores so many facets of the human condition and raises questions of whether living forever is a blessing or a curse. The movie includes a narration that pops up at the beginning and end. Some may argue that it's pointless and detracts from the movie; that it's holding the audiences hand a little too much - bringing even the stupidest viewer up to speed on what is going on. Personally, I thought that it added an extra element to the fairytale slant of the movie and worked rather neatly to bookend the story. Another element I found to be integral was Rob Simonsen's beautiful soundtrack. Again, it helps to add a fairytale feeling, as well as providing a huge boost to some of the film's more emotional scenes. Every visual aspect of the movie is also a feast for the eyes. From the various looks for the different time periods, to the painstakingly researched costumes, you can tell that all those concerned where deeply involved with what they were crafting. This was far more than just a job for them. The acting is flawless but I was totally blown away by the appearance of Anthony Ingruber, who looks and sounds incredibly like a young Harrison Ford. Of course, you have to overlook the odd awkward plot point (like how uncomfortable it must be for Ellis to realise that he's sleeping with a woman that his dad had a passionate affair with decades previously) but if you just ignore that then you'll enjoy the film immensely. Extras include A Love Story for the Ages (29 min, 36 sec making of feature. One of the highlights was in the segment where cast and crew are asked about whether they would like to live forever. Harrison Ford replies, deadpan: "I already have"); Style Throughout the Ages (18 min, 13 sec which details almost every visual aspect of the movie, including clothes, hair, film styles and camera lens); Discovering Young Harrison Ford: Anthony Ingruber, an Online Sensation (8 min, 13 sec look at how the production discovered Ingruber, who had uploaded some clips of himself on YouTube impersonating Harrison Ford's performance of Han Solo in Star Wars); 2 x Deleted Scenes (Flemming Gets Lost (2 min, 05 sec) and Gas Leak (2 min, 20 sec). It's a beautiful and very emotional movie, which is well worth spending a night in watching.